Human beings have been trading with each other for thousands of years. What is “free trade” now being touted? Just this: capitalist monopoly trade. Globalization is over 500 years old. 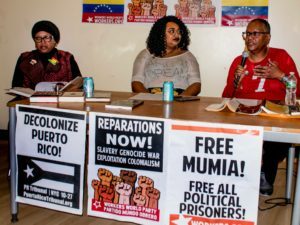 The capitalist world market was jump-started by the two greatest crimes in history: the African Holocaust and the extermination of Indigenous peoples throughout the Americas. Karl Marx pointed out in “Capital” that the exploitation of European workers “needed, for its pedestal, slavery pure and simple in the new world.” The silver mines of Potosí in Bolivia — operated with enslaved labor for centuries — lubricated the new capitalist trading system. 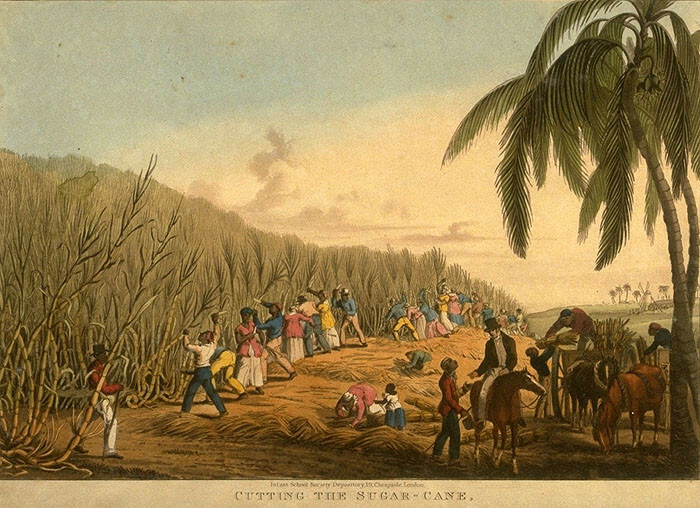 A sugar plantation in 1823. Why did Bernie Sanders praise Churchill during the Feb. 11 Democratic debate? That’s just as atrocious as Hillary Clinton lying about Nancy Reagan’s “very effective, low-key advocacy” about HIV/AIDS when in fact both Ronald and Nancy Reagan prevented any mobilization to fight the epidemic. Capitalists are always trying to find new markets in order to sell their goods at a profit. Britain’s East India Co. earned vast profits by smuggling opium into China. Among the U.S. drug dealers who accumulated fortunes was Warren Delano, a grandfather of President Franklin Delano Roosevelt. (Hudson River Valley Heritage) Only the Chinese socialist revolution stopped this drug addiction. A big victory for free trade was the 1846 abolition of tariffs on wheat imports into Britain. Capitalists claimed that “cheap food” would benefit workers. At the time these same capitalists were fighting the adoption of a 10-hour work day. Twelve hours were then standard in British cotton textile mills. The cotton was picked by enslaved people in the United States working from “no see” at dawn to “no see” at night. British factory owners wanted cheap imported food so they could reduce the wages of the then largely unorganized British workers. U.S. capitalists then use cheap imported clothing to keep pay low. That has also enabled them to raise rents. Deutsche Bank estimates that today 30 percent of New York City households fork over at least half their income to landlords. The North American Free Trade Act of 1993 allowed U.S. big business to open up low-wage factories in Mexico’s ­maquiladoras. But NAFTA’s biggest victims were Mexican workers and peasants. NAFTA effectively overturned the great land reform in the 1930s of Mexican President Lázaro Cárdenas. According to the Sierra Club, 2 million Mexican farmers have been forced off their land since then because of food imports from the U.S.
Capitalist “free trade” is 1,130 garment workers being buried alive in the collapse of the Rana Plaza factory building filled with sweatshops in Dhaka, Bangladesh, on April 24, 2013. That’s nearly eight times the number of 146 workers, overwhelmingly Jewish and Italian young women immigrants, who were murdered by the bosses in New York’s Triangle Shirtwaist Fire in 1911. Super-bigot Donald Trump wants to divert our anger over corporations killing jobs into hatred against workers in other countries. 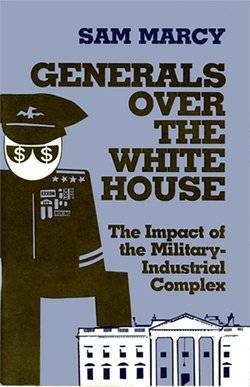 Capitalist candidates are bashing the People’s Republic of China, the Pentagon’s number one target. It wasn’t China that shut down nine of the 10 auto plants in Flint — it was GM. What we need instead is more workers’ solidarity. After Chicago workers launched the movement for an eight-hour day on May 4, 1886, four of their leaders — George Engel, Adolf Fischer, Albert Parsons and August Spies — were eventually hanged. 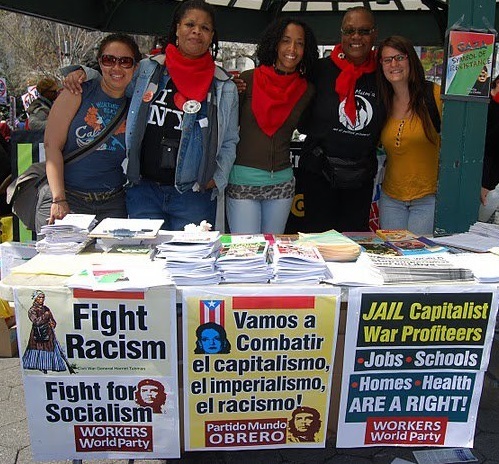 But, inspired by what became May Day, the international workers’ movement won the eight-hour day for millions of workers, with the help of the Russian Revolution.